Usuba knives are the traditional vegetable knife for the professional Japanese chef. Like other Japanese professional knives, usuba are chisel ground, and have a bevel on the front side, and have a hollow ground urasuki on the back side. 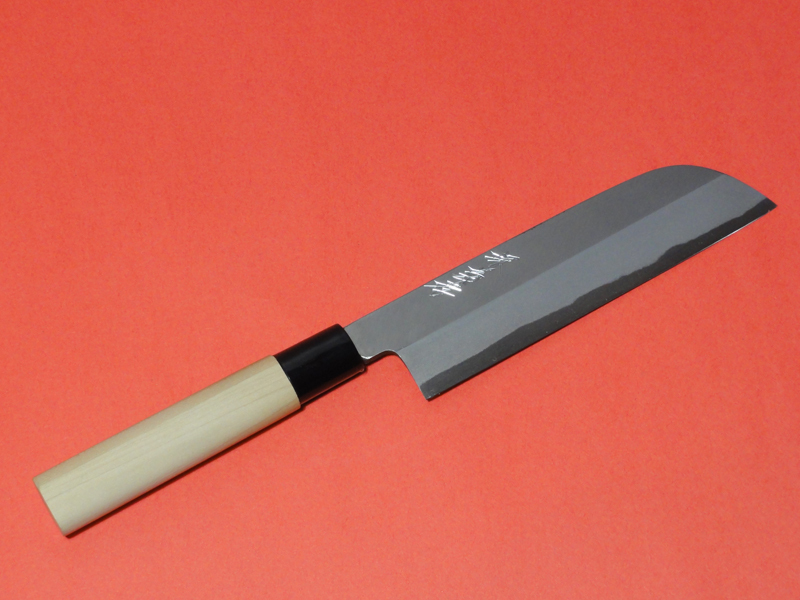 Usuba characteristically have a flat edge, with little or no curve, and are tall, to allow knuckle clearance when chopping on a cutting board. 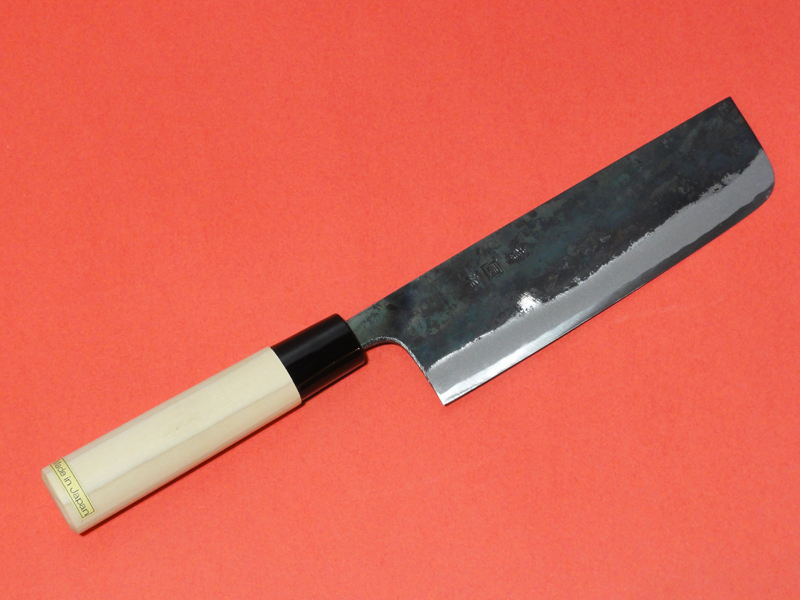 Usuba literally means "thin blade" indicating its relative thinness compared to other knives, required for cutting through firm vegetables without them cracking. The Kanto variation have a square blunt tip, making it appear like a small meat cleaver. The Kansai, kamagata style variation has a spine that drops down to the edge at the tip, allowing the usuba to do fine delicate work. However, this tip is also delicate and can be broken easily. The usuba is particularly popular with Kyoto chefs, who use the Kamagata usuba for most of their work. Since Kyoto is landlocked, they rely more heavily on vegetables than Tokyo, making the usuba the quintessential knife of professional chefs in Kyoto. In Kyoto cuisine, the versatile tip allows for intricate cuts and preparations, however due to its height and straight edge usuba in general are used for chopping vegetables, and specialized cuts such as katsuramuki, shaving a vegetable cylinder into a thin sheet. 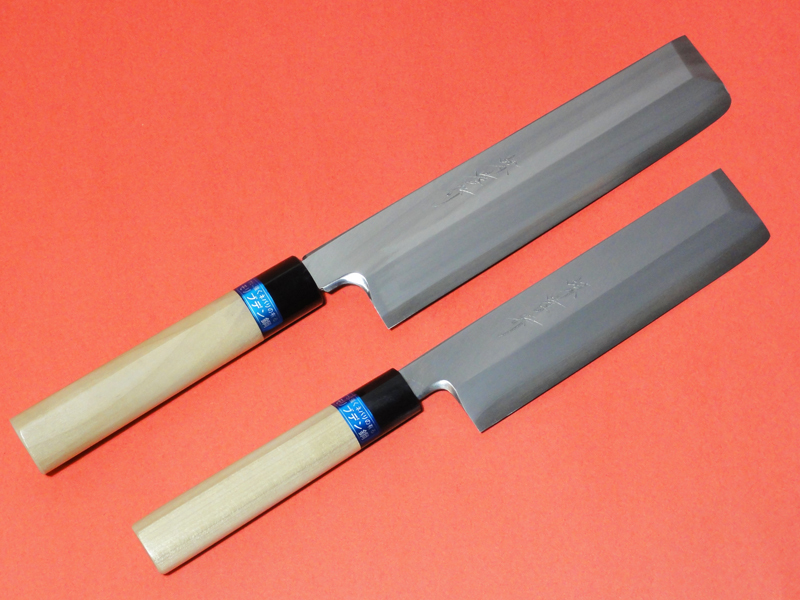 The Nakiri bōchō are similarly made but sharpened from both sides. They are preferred for home use. The blade edge is made out of White steel which is very suitable for Japanese chef knives. It is very hard steel and hold on the edge very hard. HANDLE; Magnolia with a very beautiful eagle feather pattern Water Buffalo horn bolster which is I never have seen the color and pattern. The blade edge is made out of Yellow steel which is very suitable for Japanese chef knives. It is reasonable price.